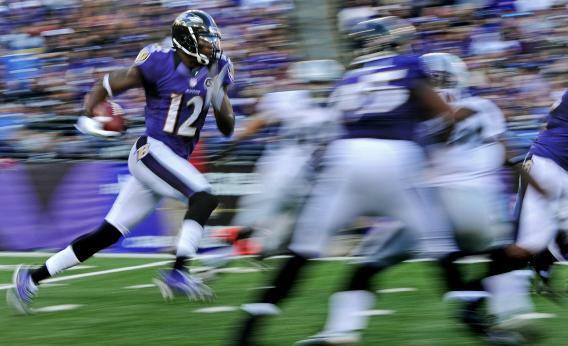 Jacoby Jones of the Baltimore Ravens returns a kickoff 105 yards for a touchdown against Raiders in November. Before we start laughing at Roger Goodell’s idea—by way of Buccaneers coach Greg Schiano—of eliminating kickoffs and replacing them with punts, let’s first analyze what this would mean for the game. The suggestion would work like this: Instead of kicking off after a score or to start a half of play, teams would be given the ball in a fourth-down-and-15-yards-to-go situation. Teams could choose to punt, which would accomplish the same purpose as a kickoff—serving possession to the other team. However, the offense could also elect to go for it. This wrinkle would replace the onside kick. Schiano chose 15 yards as the distance to go for a reason. The success rate for converting do-or-die plays with 15 yards to go is the same as for onside kicks, 19 percent. One exception is that “surprise” onside kicks—attempted when the kicking team is not in desperate circumstances—are recovered far more frequently, at over 50 percent. Under the new rule, the equivalent of a surprise onside kick would be a fake punt—a far more challenging conversion. Starting field position for the receiving team would be affected, too. Currently, with the kickoff line at the 35-yard line, the average starting field position following a kickoff is a team’s own 22. Punts from a team’s own 30 net an average of 38 yards, moving the average starting field position 10 yards further upfield, to the 32. This will simultaneously increase scoring and reduce the effective value of a score. Points will rise, but less than you might think. It will certainly be easier for the receiving team to score. In typical situations the chance of a touchdown will increase from about 17 percent to 20 percent. Field goal chances will increase similarly. Touchdown-return frequency will be affected as well. Over the past two seasons, under the new kickoff rules, kickoffs are returned for touchdowns just 0.2 percent of the time. Punts from near the kicking team’s own 30-yard line are returned for touchdowns slightly over 1 percent of the time. Punts tend to have a much higher variance than kickoffs, meaning that the spread of outcomes is wider. Kickoffs are highly predictable, especially now that touchbacks are so much more common. Punt distances and return yardage vary much more than for kickoffs. It’s not just yardage that varies, but turnovers, too. Lost fumbles are more common with punts. Slightly under 1 percent of (non-onside) kickoffs since 2011 result in turnovers. Punts from the 30-yard line region of the field result in turnovers 2 percent of the time, over twice as often. If the new rule were to take effect, things would get a little more exciting. With proposed rule changes like these, I ask myself, “What if things had always been this way? Would we want to change from that to the way things are now?” If football didn’t have the extra point—an odd play that’s meaningless to game outcomes 99.9 percent of the time—would we want to invent one? Probably not. In this case, if we’d always started the game with a punt, would we want to invent the kickoff? It’s not so clear. With the yard line of the kickoff now at the 35 and as placekickers continue their trend of booting the ball farther, it won’t be long before every kickoff is a touchback. The kickoff might soon become like the extra point—a boring formality. I’m a traditionalist, so all things being equal I’d certainly prefer to keep the kickoff the way it is. But that may not be possible in the current climate. The greatest nonlegal threat to the NFL’s place atop the American sports landscape is the growing public distaste for violence. Whether kickoffs are in fact more dangerous than scrimmage plays—what with all the routine subconcussive trauma on the line—is immaterial to the NFL. The league is operating in the realm of perception now. Roger Goodell needs to look busy, even if he’s only busily dressing windows.